Coloma, the ghost town at the heart of the Marshall Gold Discovery State Historic Park, is little more now than a handful of rebuilt buildings along Highway 49. 49, which turns off the main highway at Auburn, traces the original trail between the gold camps of the Sierra Nevada Mother Lode. The drive to Coloma is spectacular, winding high above the American River gorge, where a jogger was eaten by a mountain lion. This is still wild country, despite the well-maintained highway and the canyon-leaping bridges. Imagine what it was like 160-some years ago, when you had to ford the foaming river rapids. Your exploration of the dead buried in California’s first state park begins at the Marshall monument. Towering above the valley, the monument was erected in 1890 to the memory of the man responsible for changing the territory to a state. A year passed, before the rush became a torrent of immigrants. Sutter lost his land, his mill, and even his cattle to the gold seekers. Marshall, a spiritualist who believed that gold had vibrations that could speak to him, was hounded by men hoping he’d lead them to their fortunes. Both men died penniless and embittered. Five years after Marshall’s death in 1885, California decided to show its gratitude to the man who’d made the state’s fortune. Tens of thousands of people came to the ceremony to dedicate Marshall’s monument, including the governor. It must have been the biggest day that Coloma had ever seen. The monument towers overhead, a tall obelisk of white marble and gray granite. A relief of the Amazon queen Califia, for whom California is named, and her grizzly bear decorates the side of the monument facing the river. Above them hangs a bronze placer pan, pick, and shovel. On the monument’s opposite side hangs a bronze two-handed saw, a log scythe, and a plane: carpentry tools like those Marshall used to build the fateful mill. Below the tools is carved a relief of Marshall’s rough wooden cabin, the buildings of Coloma, and Sutter’s mill. 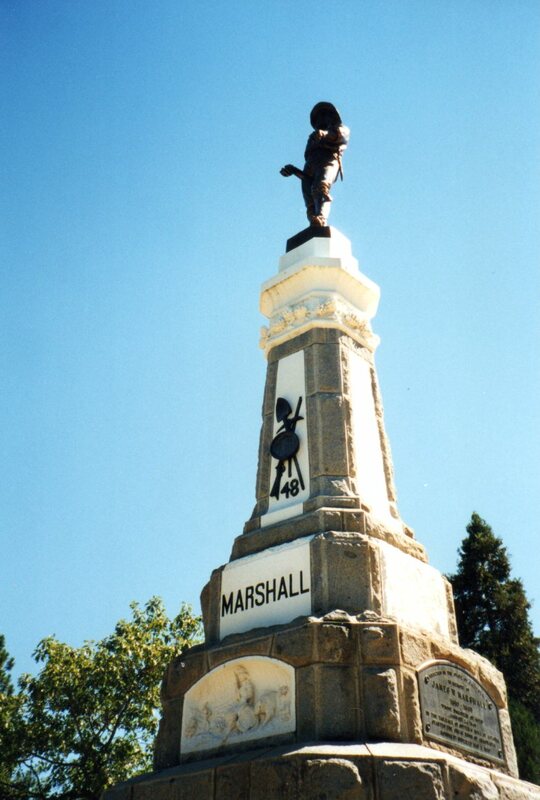 At the very top of the monument stands a statue of Marshall himself, pointing down at the river to the place where he’d found the first gold. The park’s visitor center displays a watercolor portrait of Marshall done from life, so a record exists of what he looked like. All the same, the man on the monument is shrouded by a beard and shadowed by a large soft-brimmed hat. He is fairly anonymous: the Everyman Forty-Niner. One of the park’s signs said that this spot was chosen for the monument because it was Marshall’s grave. I read elsewhere that he’d died in nearby Kelsey, where his body was packed in ice for the journey back to Coloma. 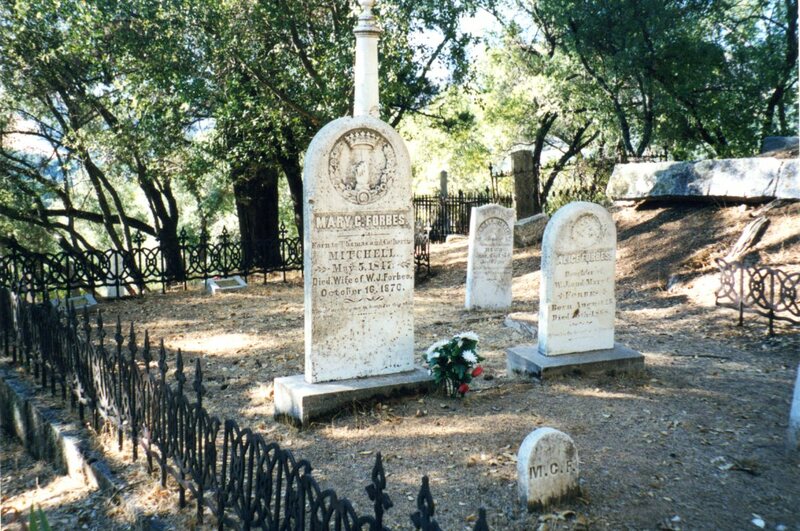 Nowhere have I found an explanation of why Marshall wasn’t buried in the pioneer cemetery down in the valley. I wondered if the ground around the monument had ever been consecrated. I wondered if impoverished Marshall had had any marker at all before the state stepped in. The Pioneer Cemetery itself lies away from the traffic on Highway 49, away from the kids panning for gold in the cold American River. 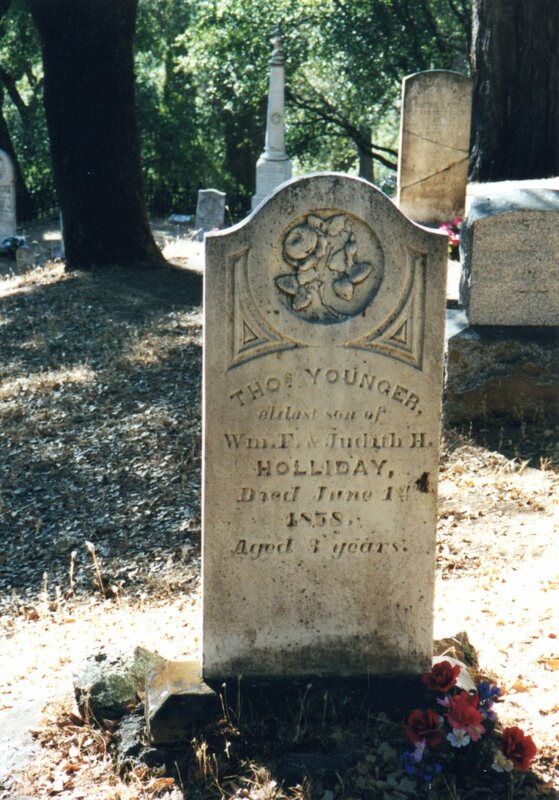 The cemetery has borne a variety of names, but was founded as the Sutter’s Mill Cemetery in 1848. All the original wooden markers vanished in the intervening years. The oldest remaining gravestone dates to 1849. A century and a half is not old in the scope of Europe or Japan, but it marks the earliest years of the American presence in California. Try to envision the California these pioneers had known. Coloma must have seemed like the edge of the earth. In the terrible winter of 1846-47, the Donner Party had been trapped by 22-foot snows near Lake Tahoe, in the mountains not far from Coloma. Like the mountain lion outside of Auburn, the Donners resorted to eating human flesh to stay alive. This was wild country, and dangerous, in which to raise a family and make a living. Could anything other than greed have sparked such a migration? After Marshall retrieved his glittering rock in January 1848, people flooded in from all over the world. The names in the graveyard ranged from Rasmussen to Sakurai, Papini to LeGuerre, McGonagle to Teuscher. The rough camp of Sutter’s Mill was transformed into a little wooden town and renamed Coloma. At its height, the town served as home to 3,000 men, women, and children. A town of any size requires a place to honor its dead. The difficult conditions — hellish heat, frigid winters, overcrowded inadequate shacks, a diet of beans, and the backbreaking labor of standing all day in bone-chilling water to scoop up pan after pan of gravel in hopes of finding a fortune — took a predictable toll. According to the Coloma Cemeteriesbooklet, the Pioneer Cemetery has over 600 known burials in 400-500 graves. Before 1851, marble for headstones had to be brought from Vermont or Italy. Such a long delivery made marble prohibitively expensive, so most monuments were simply shaped out of wood. In 1851, one of the Sacramento stonemasons discovered native marble in the Sierra Mountains. From that point on, reasonably wealthy mourners could commemorate loved ones in a more permanent way. Since 1990, a preservation society has made it their work to label as many graves as they can. Small bronze plaques with names and dates, if known, are set in concrete on some of the graves. Others have only a wooden obelisk with a typed paper label. Gold Discovery Park Association has an app. A PDF map of the park, showing the cemetery. This entry was posted in Cemetery of the Week and tagged California cemeteries, Coloma Pioneer Cemetery, Marshall Gold Discovery State Park, pioneer cemeteries. Bookmark the permalink.